The fort of Dumyat, which sits on a spur of the larger hill of the same name behind it, is in an excellent defensive position commanding wide-ranging views across the Carse of Forth to the south, and on the western edge of the Ochils. The name Dumyat is believed to derive from Dun Maeatae – the fort of the Maeatae. The Maeatae or Miathi were a tribe in central Scotland. Xiphilinus, writing in the year 208 about the campaigns of Septimus Severus, said “the two most important tribes of the Britons (in the North) are the Caledonians and the Maeatae. . . . The Maetae dwell close to the wall which divides the country into two parts and the Caledonians next to them. Each of the two inhabit rugged hills with swamps between”. Whether or not the wall Xiphilinus mentions is Hadrian‘s or the Antonine Wall has been debated by historians. But the description of “rugged hills with swamps between” could well describe Dumyat, which stands high above what was once very boggy ground. Immediately to the south of the fort is the River Forth, while to the west are Drip Moss and Blairdrummond Moss, which until the late 18th century and early 19th century were still mainly swampland, passable only by those that knew the raised pathways. The fort itself has several phases of development stretching from the late 1st millenium BC into the early 1st millenium AD. To the east and north-east of the fort, the land rises steeply up to the summit of Dumyat the hill. To the south there is a 300m (1000ft) sheer drop to the floor of the Carse of Forth. The easiest access is from the west, so this is where the defences are most significant. The first phase of building consisted of two closely-set heavy stone ramparts enclosing an area 100m by 55m (320 ft by 180 ft) entered by a single gateway on the west. Outside the gateway are further defences believed to be from a second phase of development. Inside the outer walls is a smaller enclosure crowning the summit of the site, and measuring 26m by 17m (85 ft by 50 ft), with walls almost 4m (12 ft) thick. This inner enclosure may have been contemporary with the outer walls, or it may represent a later development, where a smaller fort was built within the ruins of an older and larger one. However interestingly the inner enclosure was linked to the outer by a section of wall, possibly suggesting that they were contemporary. 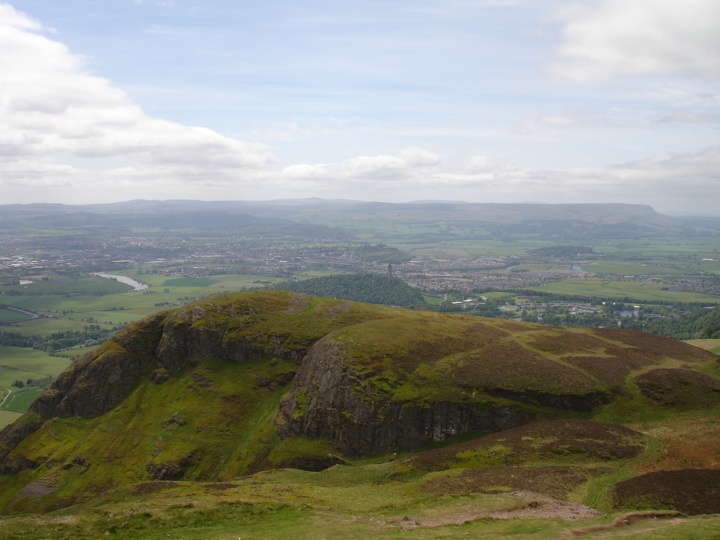 Dumyat is in the parish of Logie (Stirlingshire) and the county of Stirlingshire. Published on the 14th of May 2010 at 4:19 pm. Updated on the 12th of February 2013 at 11:52 pm.